Storied rivalry continues with two MWC contenders. Everyone has a foe that stands as a roadblock between them and achieving greatness. Whether that foe is a person, place, or thing, there’s always a struggle between the two parties. Well, in the case of the Bulldogs, that foe stands as Boise State. With a rivalry that goes back to the 1970s, the Broncos and ’Dogs will do battle once again come this Saturday at Lyle Smith Field. Boise State has an overpowering grip on this series as they lead 10-4. The Bulldogs have not won a matchup between the two teams since the days of head coach Jim Sweeney. In the last 10 years, the Broncos have held a strong lead over Fresno State, winning nine out of the last 10 meetings. “It always adds extra motivation for when we go out on the blue turf or whether we play them at home, they’re a fierce competitive and they have had our number for the past couple of years,” Thomas said. However, a new era has dawned. Under the tutelage of head coach Tim DeRuyter, the Bulldogs are off to their best start offensively and defensively in recent memory. What stands out this year from last year is the resurgence of Fresno State’s defense. The skills of Thomas as a takeaway machine will be greatly needed in the upcoming game against Boise State. The Broncos also bring takeaway machines in Jeremy Ioane and Jamar Taylor. These players will be key elements to winning this Saturday’s game at Bronco Stadium. A war will be waged in the trenches between the defensive and offensive linemen. In between the hash marks, running backs and receivers will square off against linebackers and defensive backs. Men will be measured by their success on the field. Yet, Fresno State possesses its best chance in several years to claim victory over its hated rival. If the football gods are generous, and Boise State’s offense remains less than stellar (ranked 77th overall), the ’Dogs may prove victorious against all odds. The Bulldogs, who were predicted to finish third in the Mountain West Conference by football college analysts, appear on track to finish better than predicted. The difference this year is that both Fresno State and Boise State could be potential Mountain West Conference champions this year. 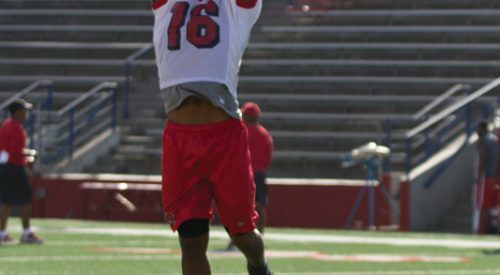 As this Saturday’s game creeps closer, Fresno State will continue to prepare for the matchup that most players won’t admit they’ve been waiting for all season long. But, until then, feelings of anticipation and excitement will be masked in preparation for Fresno State’s game of the season.